Forest Adventure Misato is the first full-scale outdoor park in Kumamoto, located by Midori River Dam, and using the natural configuration of the area. The park is available to people over 140 cm, under 130 kg, and 4th graders and above. At Forest Adventure Misato, two courses are available. 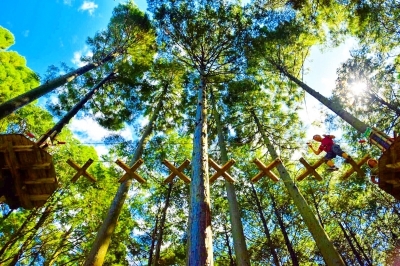 One is "Adventure Course," with dynamic and thrilling activities using tall and short trees. The other one is "Zip Trip Course," with which you can fly across the dam. This is the first dam-crossing activity in Japan. 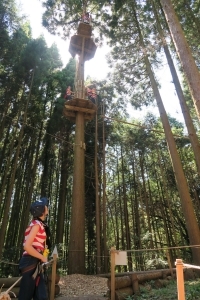 With "Adventure Course," there are as many as 40 exciting activities, such as "Tarzan Swing," with which you can jump to the safety net like tarzans, and "Minomushi Shoot," where you can jump off from the 15 meter-high platform to the ground. 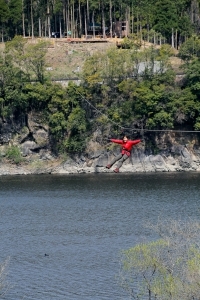 With "Zip Trip Course," you can enjoy a long zip slide across the dam. The first half is 410 meters long, and the homeward stretch is 510 meters. The way back is the longest zipline in Japan, and you can enjoy the great scenery from above. There is an adjacent campground, and BBQ facilities are also available. 60 minutes by car from Kumamoto City Downtown. Available to people over 140 cm, under 130 kg, and 4th graders and above.